Home > Articles > Dan Stories > Treasuring The Eclectic: The Story Of An Industrial Kitchen Renovation. 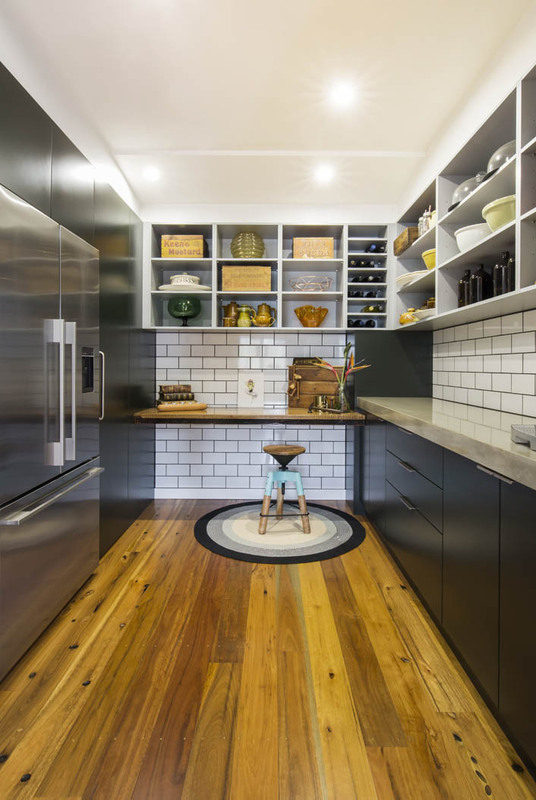 Treasuring The Eclectic: The Story Of An Industrial Kitchen Renovation. 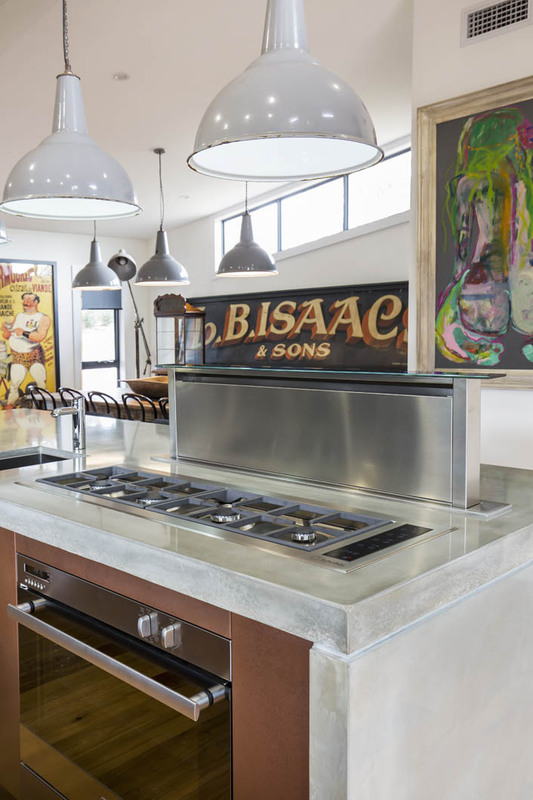 An industrial kitchen that plays with a host of raw and eclectic elements. Sophie and Craig first approached Dan Kitchens half way through their kitchen build and the team were not sure what to expect. 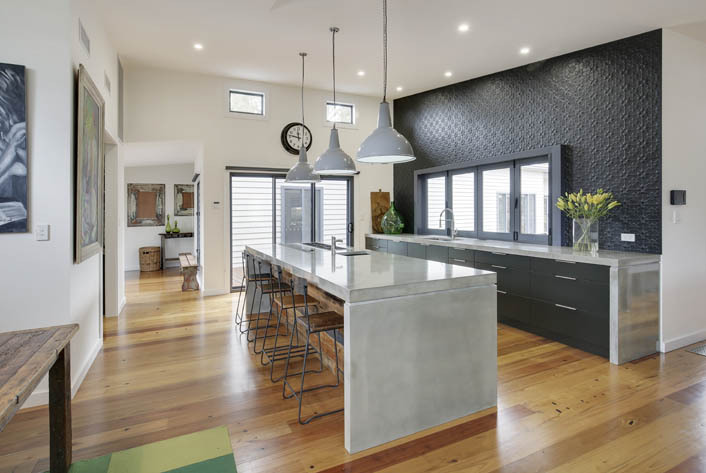 Dan Kitchens rose to the challenge and created a beautiful industrial style kitchen, pantry and laundry for the couple who live in Mulgoa. The design process started in November 2015 and was completed in June 2016. Overall image of the kitchen space with pantry entry to the left. Sophie and Craig’s love of antiques, curios and industrial furniture influenced many of the design decisions for the kitchen space. Building their kitchen was a rocky path for Sophie and Craig until they eventually found Dan Kitchens. “My husband is a carpenter by trade and he wanted to do a lot of the build himself,” Sophie said. “Craig was originally going to make the cupboards but then realised the time frame wasn’t realistic because of work commitments. Sophie said working with the other company was not a good experience so they pulled the pin on the project. “I took a long time to find another kitchen company,” she said. Inside the pantry. Many of the materials from the kitchen are revisited in this space, with the addition of white subway tiles and dark grout. 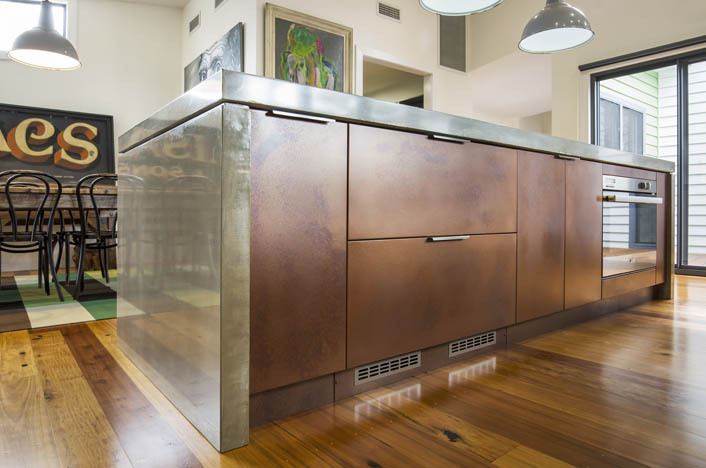 Kitchen doors made of pitted copper from Axolotl. Sophie and Craig wanted to find a kitchen company that was more capable than your average kitchen company. “We found that Dan Kitchens’ workmanship was fantastic and they were also willing to go outside the normal square,” Sophie said. The couple did not have a particular design style they wanted to achieve rather they wanted elements and materials they loved. “We do not like the run of the mill, standard or normal designs and materials,” Sophie said. The kitchen uses rustic and industrial-style materials. “I love the pressed metal splashbacks Craig did and Dan Kitchens did a great job on the rustic cupboards in the middle island bench,” Sophie said. 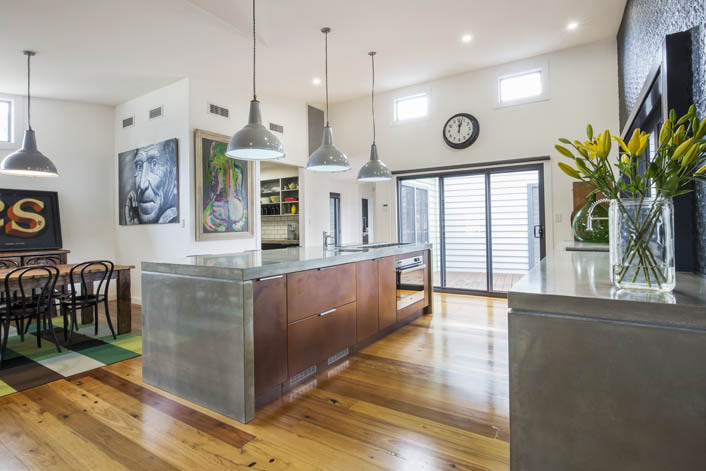 Sophie said the biggest challenge of the project was removing and repositioning the concrete benchtops because they were extremely heavy. Dan Kitchens built and installed the joinery for the kitchen cabinets, the polyurethane doors and the copper panelling. The company also installed the appliances and fittings and assisted in the selection of appliances. 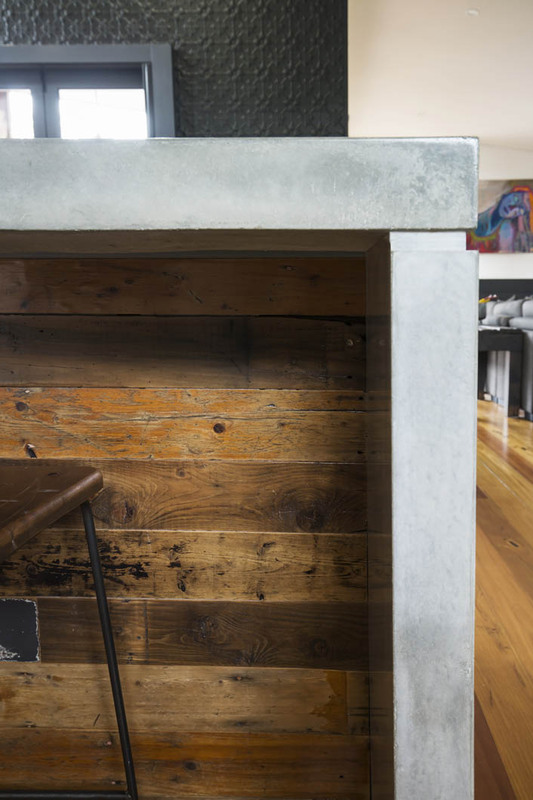 Craig’s company Craigs_Workshop created the reclaimed timber plank barbacking, the reclaimed timber bench in the pantry, the rustic bar stools and the powder-coated pressed metal splashback feature walls. The kitchen has a St George 60cm oven as well as Scholtés fridge drawers and a Scholtés flush mounted gas cooktop. A Sirius downdraft ducted rangehood was installed along with a Fisher & Paykel french door fridge. The kitchen also includes a Franke under mount sink, Bowser style tap and an integrated Siemens dishwasher. 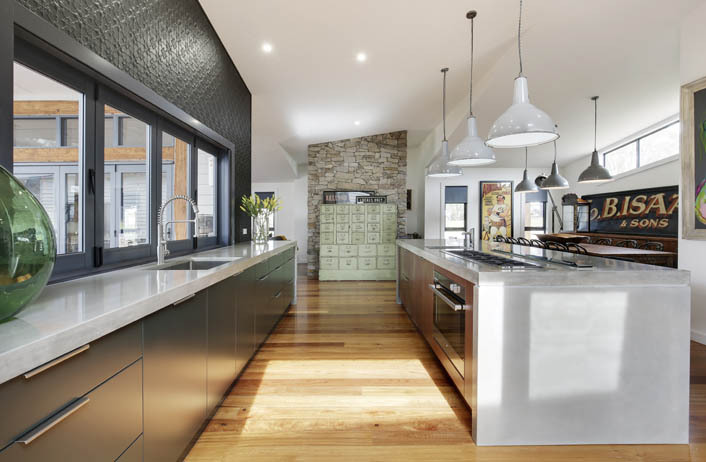 The laundry is similar to the kitchen and uses the same pressed metal splashback. Craig also made the reclaimed timber cupboards in the laundry and Dan Kitchens built and installed the other joinery in the room. 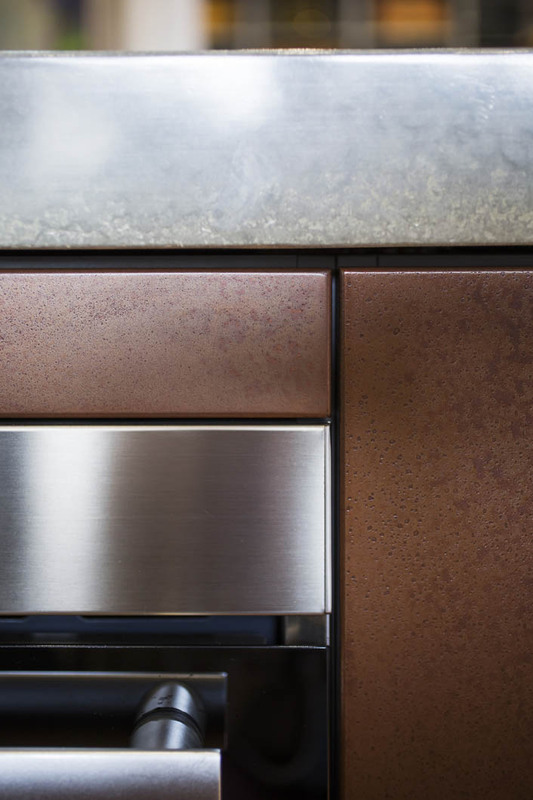 The industrial influence: Concrete is matched with pitted copper and brushed stainless steel. The bar back on the island has been crafted together using reclaimed timber. The couple said they were proud of the kitchen and enjoyed showing it off to their friends and family. “I think our kitchen represents us,” Sophie said. “Everybody who walks in gets a little surprised by the materials but we are now used to it. “I didn’t think it was too outside the box but I have been told quite a few times that it is different to a standard kitchen. “I love our kitchen and it is the main focus of our house. We spend a lot of time in there so it had to be really well made. Sirius downdraft rangehood and low profile Scholtés gas cooktop installed into the concrete island. 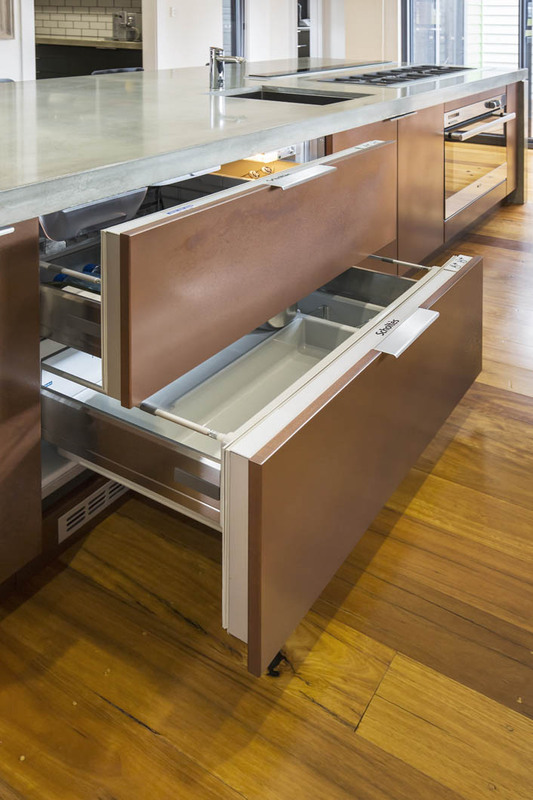 Two integrated Scholtés Fridge Drawers. Sophie said she wished she had found the right kitchen company from the start. Sophie said she would and has recommended Dan Kitchens to her friends and family. “We dealt with so many tradesman when building the house,” she said. “I would put Dan Kitchens at the top of the list. “I would recommend the design process and hardware Dan Kitchens uses through to the end result. 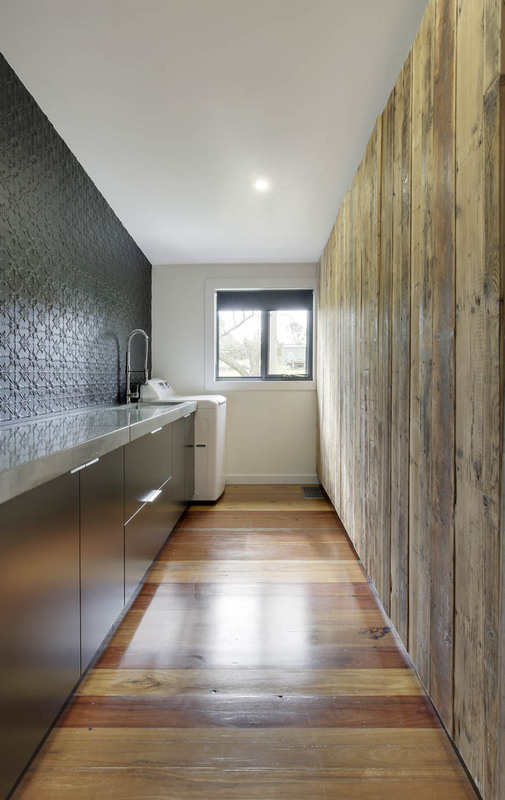 Not your standard laundry: Black satin doors, pressed metal splashback, concrete tops and reclaimed timber tall doors.